Ok... I'm just tellin' ya... I was a workin' machine yesterday!! I finished up TONS of things at my desk and computer - crossed them off the list. Then I put the binding on a baby quilt - DONE! Made all of the kits for our B-a-a-a-d Girls Club for this month - DONE! Made "adorable" little snack packs for the B-a-a-a-d Girls Club - DONE! Found a crochet pattern to make a "pretty" throw for across the corner of my bed and NEW QUILT - DONE!! Cooked a yummy dinner - DONE! Rented a 15 passenger and mini-van for our June - Primitive Gatherings trip - DONE! I'm sure there were other things... but they have escaped my brain at the moment. It was a good and productive day. So... today is another day...full of fun things to do... ride my bike??? Start my crochet project?? Run errands!! The list goes on and on... Whew...I'm tired already! Is this not cool for a wee one's birthday. 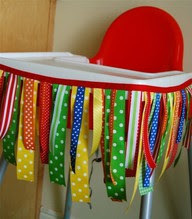 They are made to attach to the high chair tray for picture taking purposes!! I think she has it attach with Velcro... all the way around to the back of the chair. She's sewn the ribbon to bias tape and then says she cut the ribbon with pinking scissors to prevent fraying. I think the ends would be cuter cut at an angle or like a tip of an arrow. LOVE IT!! Then... check this out... when you blow up balloons with the helium.... put a marble in the balloon first... then it will hang upside down and you'll see all of the color from the balloon much better. They also had a picture of a wedding tent... the entire inside of it was filled with white, silver and sparkling balloons... it was gorgeous! 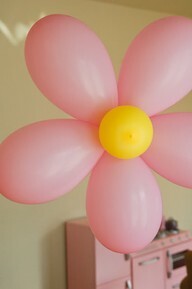 I love this daisy balloon flower... and how easy to make. 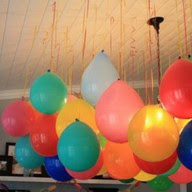 Blow up all of your balloons and tie them together... Just toooooo cute!!! I thought this was pretty funny! 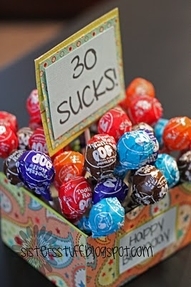 it's a box of suckers for the guests when they leave. Don't you love the sign? Did you have birthday parties when you were little? Living on the farm... it just wasn't something our parents did for us. I do remember ONE birthday party when we were little...that's it! Then Vicky and I had a HUGE birthday party when we were 60!!!! Thanks to our great friends... we had a blast!! 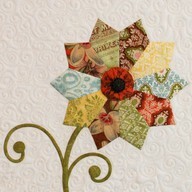 I just found this saying and I thought it was a great inspiration to make a wall hanging... with wool... What do you think? It says it all...doesn't it? Hey... I thought this was pretty clever too... especially when you have an event (wedding, anniversary party, etc) and you want to capture BIRTHDAYS of those you love! 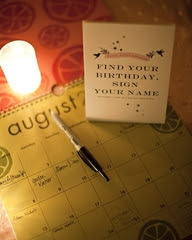 They sign in under their birth date! Isn't that a cool idea? I wish I would have thought of that! And... here is your funny - PICTURE OF THE DAY!! Yep... you guessed it... it's a REDNECK POOL PARTY !!! YEE-HAW!!! With beer and all! 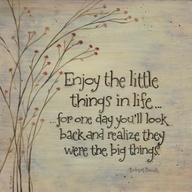 Have a great day... go out and have some fun! I'm going to a movie and dinner this evening with my friend - Karen! YIPPEE!! !